Bruce Cutknife is a member of the Samson Cree Nation in Maskwacis, Alta. He has worked on numerous projects related to Cree language, culture and history. Most recently, Bruce received the Lois Aspenes Award from Augustana University and the Pioneer of the Year Award from Wetaskiwin & District Heritage Museum. One of the first acts of colonization and settlement is to name the newly “discovered” land in the language of the colonizers or the “discoverers.” This is done despite the fact that there are already names for these places that were given by the original inhabitants. These names are more significant because they have some sort of connection to the people. This connection may have a spiritual, cultural or historical significance as other First Nations often call these places by the same names. The possibility of changing the name of the community of Hobbema to Maskwacis had been discussed since the 1970s and a decision to actually make the change was made in 2013. The name Hobbema was given by Sir William Cornelius Van Horne, then president of the Canadian Pacific Railway, because he admired the works of Dutch landscape artist Meindert Hobbema (1638-1709). Hobbema is a community comprised of four Plains Cree First Nation communities: the Samson Cree Nation, the Ermineskin Cree Nation, the Louis Bull First Nation and the Montana First Nation. At the stroke of midnight on Jan. 1, 2014, the community of Hobbema, Alta., officially changed its name to Maskwacis, Alta. The name Maskwacîs, or Maskwa cîsihk, was the area’s traditional name before pioneer settlement. It derives from “Maskwa,” which is the Cree word for bear, and “wacî,” which is the Cree word for hill or mountain. The Bear Hills. This is also the name given to the area by other tribes such as the Blackfoot and Stoney-Assiniboine. The name “Musquachis” is identified in the Palliser map published in 1865 after Irish geographer John Palliser’s explorations and cartographic journey through Western Canada from 1857 to 1860. The place name Maskwacîs is also used in other areas, and was given to places or landscapes that were populated by numerous bears. Bears, like humans, are omnivorous and their decision to stay indicated the area provided an excellent source of food and shelter. The black bear and its other ursine relatives such as the grizzly, polar and especially the Kermode “spirit bear” are considered to be sacred. Throughout prehistory, all peoples and cultures who lived in bear habitats had a significant spiritual connection to the species. Work has been done at the Maskwacis Cultural College to create a map of Indigenous place names. Local names have been identified, including Nipisihkopâhk (the place of willows) for the Samson reserve; Neyâskweyâhk (the arc of trees) for the Ermineskin reserve; Kisipatinâhk (where the high ground ends) for the Louis Bull reserve; and Akâmihk (across the river) for the Montana reserve. It is interesting to note that the English names for the reserves are the names of “government-recognized” chiefs who were the leaders at the time the reserves were formed (except for the Montana Reserve, which was formerly Chief Bobtail’s Reserve), while the Cree names describe the land. The irony is that the neighbouring non-First Nation communities have First Nation names. Wetaskiwin or “wi taskî winihk” is from the Cree word meaning “the hills where peace was made” and Ponoka is the Blackfoot word for elk. The land provided the people with all that was needed to exist. It contained a memory of activities that ensured life and survival. This is embedded with the names of the many landmarks. Irish geographer John Palliser’s 1865 map of Western Canada that includes the name “Musquachis.” The Alberta town Hobbema reverted to this name in 2014. An interesting aspect of the many names given by the colonists, explorers, missionaries and other non-Indigenous usurpers of the land seems to be the number of place names that have the devil or hell within them. Many of these places have a spiritual significance for Indigenous people, so to undermine the existing spirituality of the areas, the missionaries would incorporate Christian ideology into the naming of the locality. The missionaries refer to much of the New World as “the land of the devil.” In a video interview at the Maskwacis Cultural College, Elder Sophie Samson said, “There was no devil here, he came across with the Moniyows (White People)!” The New World was considered to be a place of heathens and savages that must be Christianized in order to enter salvation. An example of such a place was Manitô Sâkahikan. This is translated as “Spirit Lake” or, in some instances, as “God’s Lake.” There are numerous lakes and other waterways that have the word “Manito” in the name, not only in Cree territory but in other tribal areas as well. This particular lake had its name changed to Lac Ste. Anne in honour of the mother of Mary. It is said that the missionaries chose the name because they knew of the special role and place of prominence of grandmothers in First Nations culture. When I was a child, I remember a group of people visiting my father and my maternal uncle. They had come to ask for directions on how to get from our home community to a place some distance away. Both my father and my uncle gave the directions they knew to the visitors. What was interesting was how they drew the directions with a stick in the dirt on the ground. They would take turns giving their opinions on direction, route and possible shortcuts. It was interesting to hear the Cree names they gave to some of the towns, rivers and other localities, as well as the general direction of travel. 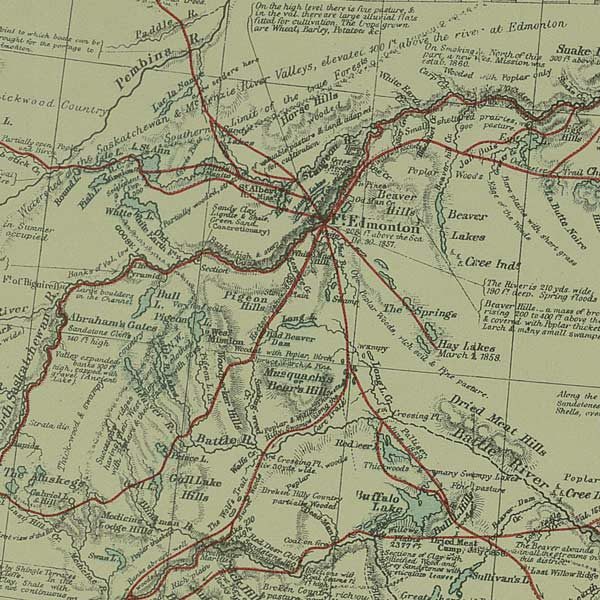 It should be noted and understood that the routes they were giving were of the existing highway network and not of any historical trade route or of the proverbial “Indian Trail.” Nonetheless, the map traced onto the ground for these visitors would soon become a forgotten memory. I would think back to this memory when Old Swan’s map was part of my university readings. The map, created by Blackfoot Chief Aka-Omahkayii (Old Swan) in 1801, showed the Pacific Northwest, the Upper Missouri River, the Columbia River, the Fraser River, the Bow River, the Rocky Mountains and the Pacific Ocean. An article by Prof. Theodore Binnema sought to explain the details and information presented by this unique example of an Indian map. This map did not follow any western examples of cartography known at the time and had therefore been labelled as “primitive.” Binemma countered this idea by stating that it was a remarkable map that covered a huge amount of territory and had to be understood on its own terms. Recent works by historians of cartography reveal that all maps are prone to misinterpretation when not approached, like any other historical document, as a product of a particular time, place and society. Maps are a product of societies, not just individuals. Mark Monmonier, the author of How to Lie with Maps, has noted that “to avoid hiding critical information in a fog of detail, the map must offer a selective, incomplete view of reality.” Old Swan’s map illustrates the very essence of successful cartography — selectivity. As it is with other peoples and cultures, their ties, knowledge and association with the land meant the difference between life and death. An appreciation and special connection to the land led to the development of a bond that would remain even after settlement on reserves. The Elders would state that you must be a relative to the land. In any event, this map was an important piece of work that did much to increase my appreciation to the lands traversed by our forefathers.